Background: Laparoscopic knot tying is difficult especially in a case of single-port laparoscopic surgery. Many surgeons in such case prefer extracorporeal knot tying. Intracorporeal knot tying, however, may be suitable in delicate situation. To master this technique enhances the surgical performance of laparoscopic surgeon. We introduce here a new intracorporeal knot tying technique called “D-loop technique”. This technique can be performed with two conventional straight graspers. Technique: The port placement is as follows. Right-hand port is positioned slightly upward from left one. (2 and 9 o’clock) Two centimeters of distance between these ports are sufficient to carry out this maneuver. Right-hand grasper holds the center of the long tail of the suture. Left-hand grasper holds the suture at the point of 5-cm away to the end. The right-hand grasper is pulled and the left-hand grasper is pushed underneath the long tail to form “D-loop” with the suture and the shaft of left-hand grasper. Then, the right-hand grasper releases the long tail, and is inserted into the loop to hold the end of the short tail. Pull the short tail back through the loop to make a half-knot of a square knot. Next, the right-hand grasper holds the same point again to form “reverse D-loop”. Right-hand grasper is inserted into the loop again and holds the end of the short tail. Pull the short tail back through the loop and a square knot is created. 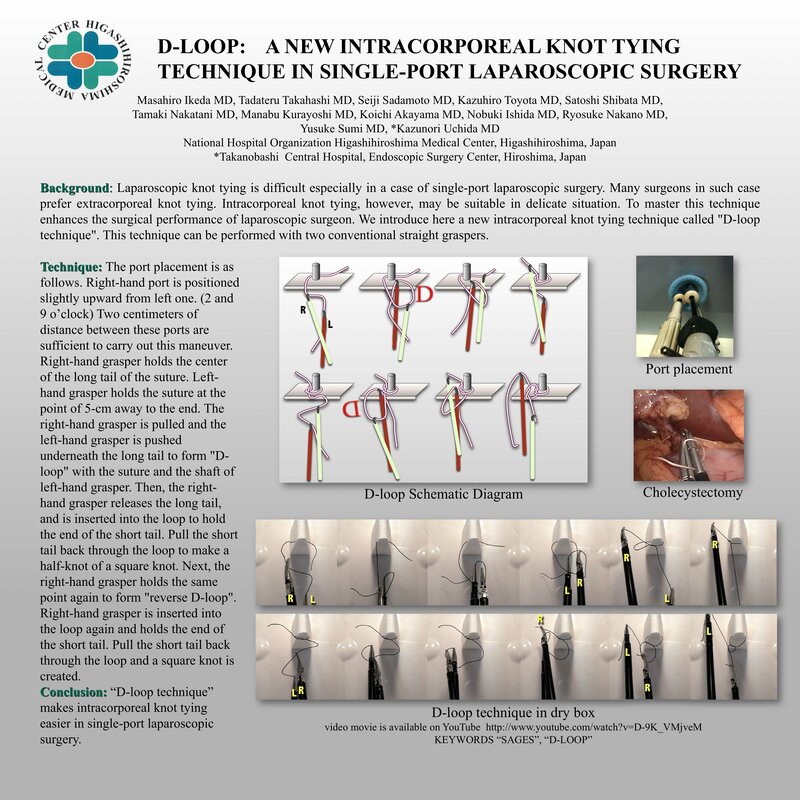 Conclusion: “D-loop technique” makes intracorporeal knot tying easier in single-port laparoscopic surgery.